It sometimes appears that the world conspires to keep the simple pleasures of life at bay, or at least that is the way things were beginning to appear to me. Sunday was the first time in three weeks or so that I had a chance to get out to the river to see if I could trick a few fish into ingesting one of the simple little nymphs I tie up at home. Some people I know think I am cruel going out to the river and catching fish. To some extent I suppose that they are right. After all, I am sure the fish would rather be left alone to get on with whatever it is that fish do in their free time. Nevertheless I fish using a barbless hook and try to cause as little stress as possible, although it would be naive to suggest that it causes none. I like to think that the fish are none the worse for wear as they swim away after being released. To my way of thinking, I am just borrowing them temporarily so that thy can be admired or photographed before returning them, unharmed, to the river. On Sunday morning I “borrowed” seven gipsy barbel in this way. Four of these came from the Río Grande, which has thinned somewhat since my last visit, and the others from the Guadalhorce. I decided to fish the Río Grande first since it is a very popular picnic spot and I wanted to get there before the river was overrun with people. Despite having lost some of its flow, the Río Grande, was looking lovely. 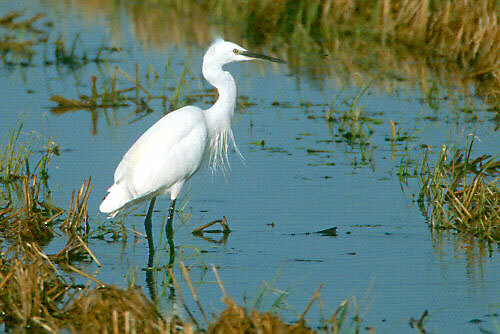 In the quiet of the early morning there were lots of little egrets and mallards feeding in the shallows. The barbel were cruising a large shallow pool and would venture upstream and into in the shallows of the main current. Here, facing unpstream, they could be persuaded to take a fly. There were still a few bee eaters around. Many have moved further north since they arrived from Africa a month or two ago. In the late summer they will be back again in numbers as they prepare for the return leg of their journey across the Mediterannean. I also had the good fortune to spot a hare (I have seen very few of these) and, on a rock island in the river, a number of turtles. I knew that I ought to take a picture of the turtles pretty quickly since they drop like stones into the water if they feel threatened and I just about managed a picture before they took the plunge. Some great posts recently – You will have to look into putting the TV programme onto Youtube or Vimeo, when it’s broadcast next year I’m sure there would be a lot of interest in watching it outside Spain. I’ll be over you way by the 22nd June – as discussed it would be great to meet up and try for a Barbel. Hopefully there may be bee eaters still around too – do they migrate before the middle of September ? I’ve never seen them when I’m over there. I’m always amazed by the number of raptors in Spain, in addition to the griffon vultures that you see virtually all the time in the hills, every day there always seems to be something else that makes you slam on the brakes grab the bino’s and scramble out of the car! Last year in Gaucin we saw Short Toed and Booted eagles every day! What’s the best way to get in touch ? If you send me an email to ssjjtthhoommoo@googlemail.com I could mail you when I get to Andalucía and see when’s best for you – I’m there for a week and nothing is planned. It´s good to hear from you. I have sent a message to you on the address provided.